The vast majority of loading chutes are constructed using standard components, but are of course adapted to the conditions at each plant. Furthermore, they are designed to meet the specific application, in addition to a solution – drawn up in consultation with Cimbria – that meets the specific needs of the customer concerned. The loading chutes are sold both directly to end-users and via a number of distributors and dealers. Tizir in Norway contacted Cimbria Unigrain with an enquiry for a loading chute for discharging titanium. Due to the fact that there was insufficient built-in height on the existing belt, the loading chute was required to be pulled up under the belt when it was extended over the side of the ship. The capacity was specified as 800 t/h, the length of the loading chute was approx. 20 m and it had to have a built-in filter. Loading chute with tilting mechanism. The solution to this task was a V400 with filter outlet which, following some development work, was provided with a tilting mechanism such that it could be pulled up under the belt, after which it could be run out to the ship. Since titanium is a very abrasive material, all parts coming into contact with titanium are executed in Hardox steel. The loading chute is also equipped with a universal joint, in such way that it always hangs vertically when the derrick is raised and lowered. In conjunction with installation and subsequent commissioning, Cimbria Unigrain had a supervisor present at the customer’s premises. From Bolidan in Skelleftehamn, Sweden, Cimbria Unigrain received an enquiry for a loading chute for loading lead and zinc concentrates onto ships. The capacity was stated at 1000-1500 t/h, in addition to which the material was very fine and dusty. The required length of the loading chute was 15 -20 m and there was a need for an integrated filter. The main challenge was that the solution had to be able to cope with ambient temperatures as low as -35° C. The chosen solution was a V650 with filter outlet in which all the electrical components are designated to be able to cope with an ambient temperature of -40° C. In addition, the loading chute is equipped with an extended inlet and chutes in Hardox, as the material is abrasive. The loading chute was delivered in August 2017 while the total price included a supervisor from Cimbria Unigrain and a service visit one year after commissioning. From Telestack, a Northern Irish manufacturer of mobile shiploaders, Cimbria Unigrain received an enquiry in December 2016 concerning a solution for the loading of grain at a rate of 500 tonnes per hour. The solution had to include an integrated filter, as well as two loading chutes. 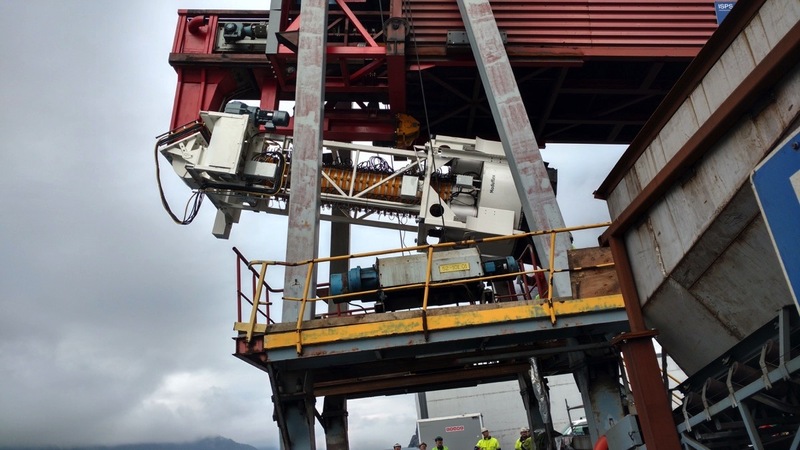 Cimbria and Nibolon arrived at a solution featuring a V500FF10 model and intake for Telestack’s mobile ship-loader. The loading chutes are produced as an OEM project, delivered in colours that match Telestack’s. Finally, the order was for six units, delivered in three stages. In conjunction with the first delivery, Cimbria Unigrain carried out a test of the loading chute fitted to the ship-loader at Telestack’s factory in Northern Ireland. The final two loading chutes were delivered in November 2017. Loading chute executed as OEM unit fitted in mobile ship-loader. 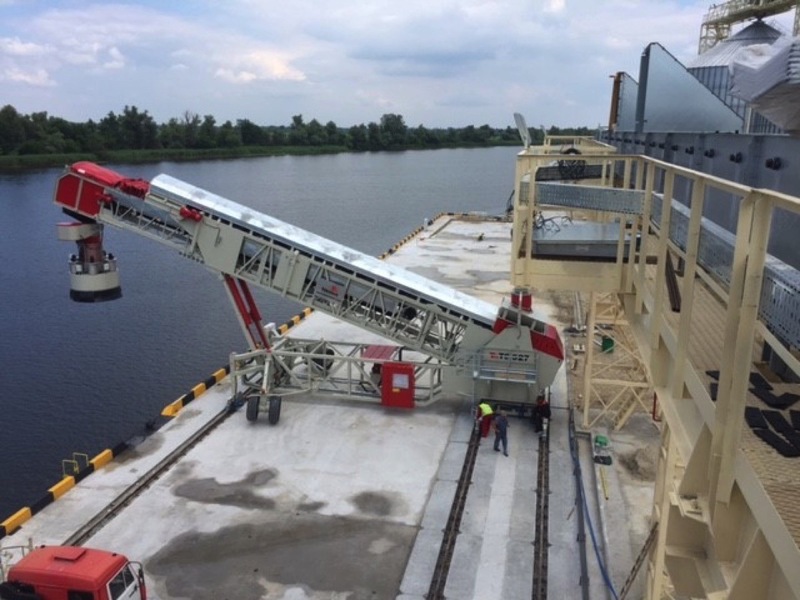 From Cimbria’s dealer TBMA Europe in the Netherlands, Cimbria Unigrain received an enquiry for four loading chutes for stockpiling The end-user, Eurochem, needed a plant for the discharge of phosphate under special temperature conditions (product temperature ranging from -30⁰ C to +80⁰ C, with ambient temperature down to -38⁰ C). Unloading of phosphate into a warehouse. The chosen solution was four V300F/39s with all electrical components designated to cope with ambient temperatures as low as -40⁰ C. The control units were supplied with a heating element, whilst the skirt on the outlets was specially produced in silicone rubber. All parts in the loading chutes that will be in contact with the material are fabricated in Hardox 400 due to the fact that phosphate is very abrasive. As the loading chutes are relatively long, they are equipped with a 4-m-long inlet pipe in order to be able to better concentrate the product in the centre of the chute. Cimbria Unigrain’s dealer in the Baltic, Firma Luicija, received an enquiry from RIMO, which was looking for a loading chute with trimmer for a newly-developed shiploader which the dealer was charged with drawing up for the MUUGA terminal at the Port of Tallinn, where wood pellets were due to be unloaded. After one or two preliminary proposals, RIMO and Cimbria Unigrain agreed on a newly-developed trimmer with slewing bearing in stainless steel. The purpose of the shiploader is that it is “fed” by trucks with a tipper. 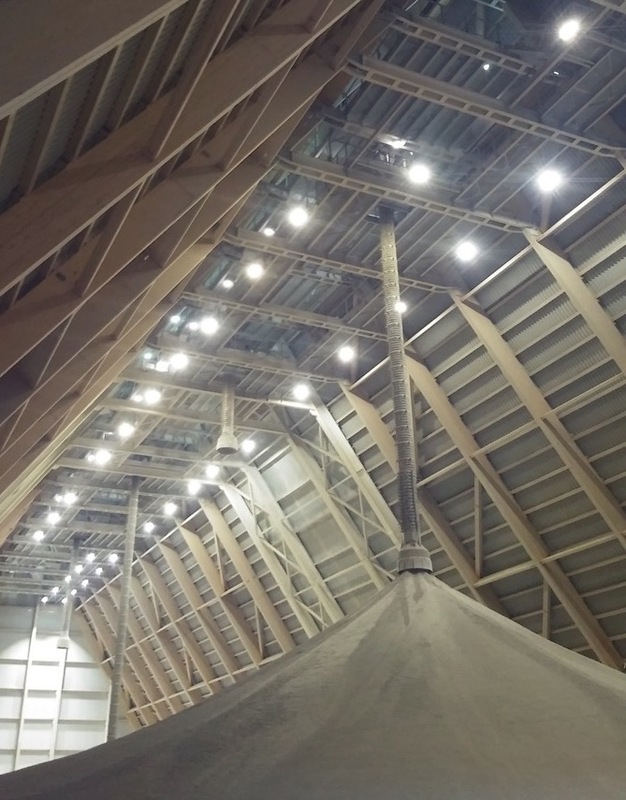 The wood pellets are conveyed via a belt up to the loading chute, after which they can be distributed over a larger radius than normal due to the rotating trimmer at the outlet. Hi, I am Jaireh Esteves of HG Silos, Inc based here in Philippines. I would like to request for a quotation of Automatic Mobile Telescopic Chute on Rails (For Warehouse application).